Welcome to my tour stop for Paul Mark Tag's How Much Do You Love Me?, a story about a Japanese American and her family who were living in the United States when Pearl Harbor was bombed. You can read my review for this book here. Scroll on down to find out more about the book, read an interview with the author, and enter a giveaway for a ebook of your own!! Why did you choose to set your story How Much Do You Love Me? during World War II and then also parallel it to a later point in the future? I wrote my story from two points of view: one from a character (Keiko) who lived during World War II; and the other in the year 2000 from her daughter Kazuko. (As a convenience here, I will refer to the front story (the year 2000) and back story). Because my novel revolves around the Japanese internment of World War II, that period defines the back story. However, that back story originates in the front story after Keiko has a stroke and lies in a coma; I use her situation as a mechanism for telling the back story. The tension in the front story builds when Kazuko, following a chance occurrence, suspects that her mother has been hiding a family secret. Kazuko begins a mad chase to uncover this mystery before her mother dies. I weave my story back and forth between the two time frames. Clues to this secret are sprinkled throughout Keiko’s story of her life. Can you tell us a little about the main characters, who they are and their characteristics? Although Kazuko is the main character in the front story, her primary role is in uncovering her mother’s secret. Keiko, from her World War II memories, is the principal protagonist. Who is she? She is the daughter of Isamu and Akemi Tanaka, Japanese immigrants; she has one brother and two sisters, one of whom is an identical twin (Misaki). Following the bombing of Pearl Harbor, their family (along with all West Coast Japanese) gets caught up in the anti-Japanese frenzy and finds themselves incarcerated in an internment camp. There is a second family in the World War II story, the Armstrongs, whose Caucasian son James falls in love and marries Keiko shortly before he goes to war and Keiko’s family is interned. What was the most difficult part of writing the story or most difficult part of the story to write? How Much? is a love story/mystery set within an historical novel. The most difficult aspect for me was to achieve a balance between the front story and the back story. Because my previous writing experience involves fast-paced thrillers, the front story was easy for me because it takes on thriller aspects (the clock starts ticking once Kazuko learns that her mother is near death). What worried me most was keeping both love story/mystery (even here, there is a further distinction between romance and mystery) and historical novel readers simultaneously satisfied. Historical fiction readers will appreciate (at least I hope so) the detailed internment experience (and its injustice); readers who love the thrill of the chase will appreciate the front story; and romance readers may like both. I hope that I’ve achieved the necessary balance to keep everyone happy. Do you have a favorite scene or quote from the book you could share with us? Most who read my book will not find my choice particularly notable. It occurs at the conclusion of a dinner at the house of my protagonist’s (Keiko) fiancé, James. Without giving away too much detail, this second meal together (between the two families) follows an earlier dinner when Keiko and James announced their intention to marry, creating a firestorm of reaction and emotion, particularly within Keiko’s staid and tradition-bound Japanese family. At this subsequent dinner, James makes a joke that recalls that earlier dinner. Everyone at the table cracks up, including Isamu and Akemi, Keiko’s parents. Why am I so affected by this scene? Because of the emotion it would have raised in Keiko’s observation. I have memories of my grandparents (mother’s side) who were not prone to hilarity. To have seen them laughing together would have been a memorable experience—but one which I do not have. I can easily tear up when I read those two sentences. What do you hope readers get out of your story after they’ve read it? What book are you most looking forward to reading this year? I just finished reading Umberto Eco’s The Name of the Rose. Set in the year 1327, it is a detective story set within a wealthy Italian abbey. Brilliant, educational, and humorous, nonetheless at over 536 small-print pages, this book required perseverance (at least for me) to get through. For my next challenge I ordered The Great Gatsby by F. Scott Fitzgerald, expecting something maybe not quite so daunting but similar. Imagine my surprise when in the mail came a book that weighs in at only 180 pages, with much larger print. After Eco’s book, I’m looking forward to this respite. Paul Mark Tag graduated with multiple degrees in meteorology from Pennsylvania State University and worked for the Naval Research Laboratory as a research scientist for over thirty years before retiring to write fiction. For years prior to retirement, and the following year exclusively, he honed his skills writing short stories. These have been published in StoryBytes, Potpourri, Green’s Magazine, and The Storyteller, as well as The Errant Ricochet: Max Raeburn’s Legacy.In 2005, he self-published his first thriller, Category 5,which took advantage of his knowledge of meteorology and weather modification, followed by Prophecy and White Thaw: The Helheim Conspiracy. 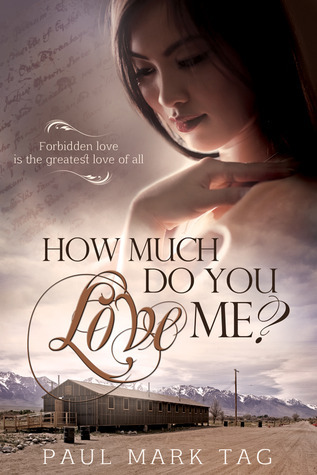 With his historical novel How Much Do You Love Me? he has switched genres. He lives with his wife, Becky, in Monterey, California. To find out more about Tag's books, go to Goodreads.